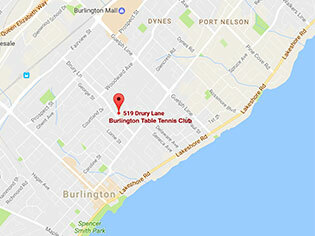 Burlington Table Tennis Club has 5 tables to play. Our volunteers set up tables before open time and at closing time. A Players must bring their own rackets and balls to play. Due to the limited number of tables and in order to allow everyone a chance to play, we enforce a 20 minutes play rule per table. In addition, a maximum of 17 players will be accepted at the same time on the floor. Every Friday from September to May. Exceptions may occur. Entrance fee is $8. We accept all walk-ins up to a maximum of 17 players at a time, on a first come, first serve basis. © 2015 Burlington Table Tennis Club.